The paddle course on tour. Back in August I spent a few days at Messums Wiltshire, this is an extraordinary art, performance, and social space based in and around the most beautiful thatched tithe barn. The place is run by the London art dealers Messums as their outpost in the country. I ran my paddle course for two days with a jolly group of keen whittlers and lots of people came on the first evening to listen to me talking about boatbuilding and look at beautiful photographs by Mike English projected onto a huge screen. I took “Peggotty”, a single skiff built in 1923 by Messums who were well known boatbuilders on the Thames. 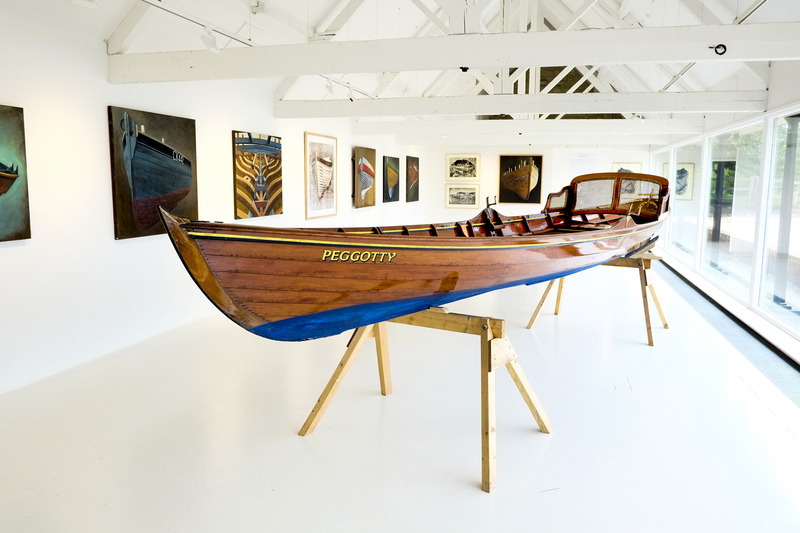 She was displayed in a side gallery with James Dodds beautiful paintings and wood cuts of traditional boats.